This independent math center includes everything you need for students to stay engaged in learning independently while you teach guided math. 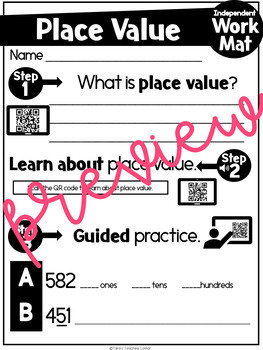 This resource will help students to understand place value and guide them to interpret the place value of numbers on their own. 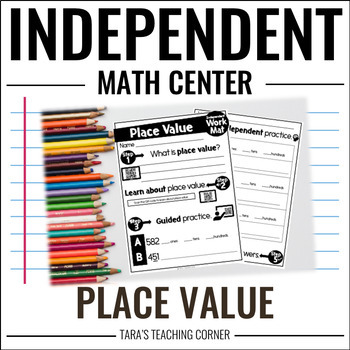 This independent math center can be completed during a single math lesson, but can easily be used over several days depending on the needs of your classroom. Your students will need a device that scans QR codes. Old phones, tablets, and computers will all work. Click here to download a free QR Scanner app. This independent math center was developed with second graders in mind, but may be appropriate for some first or third grade classrooms. Step 1: Students will be introduced to important vocabulary. They will scan a QR code and record the kid-friendly definition. Step 2: Students will scan the QR code to watch a NumberRock video about the targeted skill. Step 4: Students will complete a set of independent practice problems. 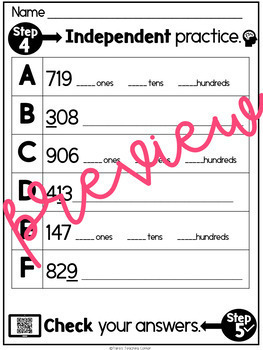 Step 5: Students will scan the QR code to check their answers to the independent practice problems.